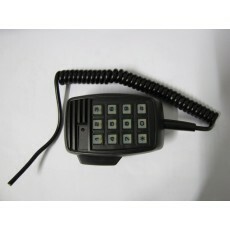 Codan 9323/9360/9780/9390 Microphone keypad housing and cord. New "Compatable" Codan 9xxx Mic outer housing with keypad*/Mic insert/PTT switch and curly cord fitted. This is already semi-wired, you just need to fit your existing encoder PCB and 7 pin plug and you are ready to go. *Note that the text on the keypad has numerics and #* only . Note also that you have to be handy with a soldering iron to get this up and running.